Tree from Bruvo-Madaric et al. (2005) with addtions from Huber (2000, 2001, 2005, 2007) and Dimitrov and Ribera (2005). Most of the pholcines genera have an Old World distribution. A notorious exception is the genus Metagonia, a New World genus which was found to be more closely related to the pholcines genera than to the genera in the New World clade. 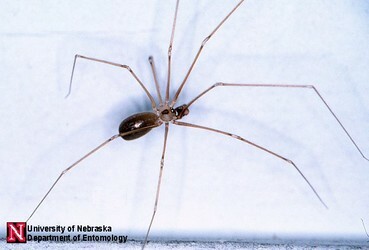 Many pholcines species live in man-made structures, and common synanthropic species such as Pholcus phalangioides or Pholcus opilionoides are probably well known to everyone, however, pholcines is a very species-rich group with representatives living in a wide variety of habitats. The presence of a pedipalpal trochanteral apophysis and a lateral cheliceral apophysis, which interact and provide a locking mechanism for the rotated pedipalp during copulation in Pholcus and several other pholcid genera, was used by Huber (1995) to define a group of pholcids which he named “Pholcus group”. Pholcines or Pholcus group was used ever since to refer to this group of genera. In addition to the pedipalpal locking mechanism mentioned above, phylogenetic studies have found several other pholcine synapomorphies. These are: the presence of grooves on the cheliceral hairs, the tubular and membranous embolus, and the embolus spine (Huber, 2000). The tree used to represent the current phylogenetic hypothesis for pholcines summarizes the results of various phylogenetic studies using molecular and morphological characters (Bruvo-Madaric et al., 2005; Huber, 2000, 2001, 2005; Dimitrov and Ribera, 2005). None of these analyses has challenged the monophyly of pholcines, but internal relationships are still largely unresolved. Although Metagonia and Spermophora have the synapomorphies of the group and always appear to be closely related to the rest of pholcines genera, the question about their exact phylogenetic placement remains open. Dimitrov D., Ribera C. 2005. Description of Ossinissa, a new pholcid genus from the Canary Islands (Araneae: Pholcidae). ZOOTAXA 982: 1-13. Huber B.A. 1995. 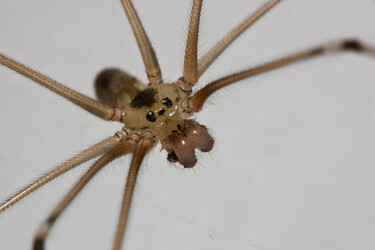 Copulatory mechanism in Holocnemus pluchei and Pholcus opilionoides, with notes on male cheliceral apophyses and stridulatory organs in Pholcidae (Araneae). Acta Zoologica, Stockholm 76(4): 291-300. Huber B.A. 2001. The pholcids of Australia (Araneae; Pholcidae): taxonomy, biogeography, and relationships. Bulletin of the American Museum of Natural History 260: 1-144. Huber B.A. 2005. High species diversity, male-female coevolution, and metaphyly in Southeast Asian pholcid spiders: the case of Belisana Thorell 1898 (Araneae, Pholcidae). Zoologica 155: 1-126. Huber B.A. 2007. Two new genera of small, six-eyed pholcid spiders from West Africa, and first record of Spermophorides for mainland Africa (Araneae: Pholcidae). Zootaxa 1635: 23-43. Page: Tree of Life Pholcines. Authored by Dimitar Dimitrov. The TEXT of this page is licensed under the Creative Commons Attribution-NonCommercial License - Version 3.0. Note that images and other media featured on this page are each governed by their own license, and they may or may not be available for reuse. Click on an image or a media link to access the media data window, which provides the relevant licensing information. For the general terms and conditions of ToL material reuse and redistribution, please see the Tree of Life Copyright Policies.